The odometer rolled over on another modern era with typical to-the-minute precision: "For Detroit, the 20th century ended at 5:47 p.m. October 24, 1998." True to form in the Motor City — mythic land of the annual new model — Detroiters got a head start on the coming century as the rubble met the road. "With a deafening roar that will echo in the hearts of Detroiters for decades," said the local press, the long-barren J.L. Hudson Company department store careened its way into the dustbin. "Explosions raced across the building, shearing off pillars as they moved northwest: men's suits on two; junior dresses on five; the community auditorium on 12," until even the cork-lined fur vaults on the 17th floor (capacity: 83,000 furs) blew apart and "the mammoth structure wobbled like a drunk, hesitated, then collapsed into a 60-foot-high pile of rubble." 1 The sprawling, 28-story downtown emporium had been branded "the symbol of one of the most notorious episodes of urban decay in America's history." 2 The store hit its peak sales year in 1953, and it was all downhill from there. Its bronze doors slammed shut for good in 1983, entombing memories of Santa Land, elevator ladies, and Maurice salads within its brooding shell — a "decrepit behemoth's carcass," detractors said, blighting the city. The Downtown Development Authority wanted it blitzed. The Loizeauxs were happy to oblige. As the blast commenced and the "symphony of failure" reached its crescendo, spectators duly took note. "It sounded musical," sighed one rooftop partier, munching on shrimp and pastries. "It was so graceful." 6 As it happened, there was an added tinkling effect when the 27.7-second blast shattered 132 windows in surrounding vacant buildings. The Loizeauxs said that 92 windows were already cracked, and they expected the breakage, which they thought would cost about $10,000 to fix (seven separate glass companies were already on high alert for the occasion). The sheet music took a more consequential detour, however, when six columns went akimbo during the implosion and landed on a nearby concrete box girder, knocking out service on a 350-foot chunk of Detroit's elevated People Mover railway, only a dozen feet away. ("The People Mover won't be moving any people for a while," was the press's mordant take. 7) After an initial glance, a manager downplayed the damage as "cosmetic," but it ultimately took a year to fix the line and restore the system to full capacity, irking Detroit bigwigs who claimed the incident cost one million dollars in lost People Mover revenue, stymied thousands of riders, and just plain looked bad. After various lawsuits, quarreling engineers, and sparring insurance companies had all been accounted for, the total bill came to more than four million dollars. Martius finally relented, it seemed, and the media soon blipped off to other pressing matters (Boy Sprays WD40 in Teacher's Sports Drink, the headline read one day later). The Hudson's smoldering remains, meanwhile, yielded up some crowd-pleasing artifacts, which Homrich Wrecking, the Detroit company overseeing the demolition, offered to local charities. More than 2,600 bricks from the site were sold off at an area Goodwill store in two days at five dollars a pop. "The newest fad?" You guessed it: "A hunk of rubble from the Hudson's building." 17 As the loss of the beloved structure soaked in around the nation, however, the high-fives gave way to melancholic afterthoughts. "A piece of me died when I saw on national television the implosion of the venerable Hudson's department store," a former Detroiter wrote in from Austin. "I certainly hope that somebody was astute enough to rescue the ornate brass drinking fountains scattered through the store. They were lovely." 18 The copper and brass fixtures, it was said, had long since been stripped out by vandals. Many houses that did get torched would simply be left to rot, much to their neighbors' consternation. This proved a source of further unintended ironies in Detroit. What with an endless backlog of buildings to demolish — and often no budget for the bulldozers — the city was not known for rushing wreckers to the scene after a call came in from a burned-out citizen. Dan Pitera, who directs the Detroit Collaborative Design Center at the University of Detroit Mercy, sensed a creative-destructive opportunity at hand. "If you look at a burned house," he once told me, "they actually can be quite beautiful, if you don't have the negativity of what it means for them to burn." So Pitera and colleagues launched the "Fire-Break" project, a series of installations in and around picturesquely charred houses on Detroit's east side. Working with community members, they created sites such as the "Sound House" (where musicians from the neighborhood played Cajun tunes, while brightly colored fabric hung from its openings) and the "Hay House," covered with 5,000 tiny bundles of hay in a nod to urban farming. (In the city's fallow building lots, alfalfa is a popular crop, as it helps detoxify contaminated soil. It's hard to believe, but numerous residents have also turned derelict "crack houses" into "hay houses," used to store bundles of hay.) "We do all this without permission," Pitera explained. "They're intended to be mercenary acts." They hit their mark. In some cases, neighbors had been clamoring for years to get these particular houses destroyed, and a little art worked wonders. The design group's installations attracted the eye of city authorities, who sacked the structures within weeks. "Every house we've done so far has been demolished," Pitera said proudly. "When you consider there are 8,000 houses and we've gotten five torn down, it's pretty daunting." This romantic vision of destroying the city in order to save it continues to tantalize urban thinkers. The scholar Witold Rybczynski was still working out the finer points of the concept just a few years after Detroit's dust-up over downsizing. The de facto abandonment of America's corroding cities was to be encouraged, he said, echoing Starr's bold thesis. "Housing alternatives should be offered in other parts of the city, partly occupied public housing vacated and demolished, and private landowners offered land swaps," Rybczynski wrote in 1995. "Finally, zoning for depopulated neighborhoods should be changed to a new category — zero-occupancy — and all municipal services cut off." Thus was born the dream of the "comprehensive downsizing of cities," an urban slash-and-burn operation that made Detroit's demolition binge look like kid's stuff. 45 Meanwhile, captivated by this apocalyptic panorama of "de-densified" cities wrecked beyond all hope, still other scholars have tried to get a grip on the broader phenomenon of "shrinking cities." Pointing out that shrinkage is a growing, worldwide affliction — the United States, Britain, and Germany are faring the worst, but places as disparate as Phnom Penh and Johannesburg have shed more than a third of their population — this camp reports that for every two cities that are growing, three are shrinking. And that's a recipe for destruction. "Traditionally, urban planners advise bulldozing eroded neighborhoods and starting from scratch," said Philipp Oswalt, project director for the three million dollar research project earnestly studying the newly diagnosed "shrinking city syndrome." 46 As in so many things, it seems, Detroit was ahead of its time. In an extraordinary series of reports in July 1989, the Detroit Free Press counted 15,215 empty buildings in the city, a cancer the paper called "an infection more pervasive than ever documented" and testimony to the exodus of middle-class families "that is both a cause and a result of the economic decay that has crippled many Detroit neighborhoods." 47 The saga of Detroit's struggle to demolish this staggering inventory makes for one of the oddest episodes in modern urban history. It's a Pilgrim's Progress of vigilante wreckers and emergency demolition orders, a perilous journey through the eye-opening wilds of what one writer called Detroit's "spontaneous evolution of aggressive dismantling." 48 The city had plunged into the slough of wrecking despond at least as early as 1958, when a survey estimated that it would cost $1.2 billion to raze all of Detroit's blighted buildings — that's 60 million dollars a year for 20 years. By the time of the Free Press survey, however, officials had gotten a little behind in their demolition payments. At that time Detroit had razed an average of 2,000 buildings a year since 1982 — at nine million dollars per year, or $4,500 per home, a figure that had shot up more than 50 percent in five years. That was serious wreckage, the paper reported, but it wasn't even holding the line. Every year in Detroit an estimated 2,400 structures became newly vacant and in dire need of destruction. 1 Ron French, “Razing Paves Way for Renewal,” The Detroit News and Free Press,<./i>, 25 October 1998. 2 Kristin Palm, “One Building’s Struggle,” Metropolis, June 1998, 39. 3 Nadine M. Post, “Record-Breaking Implosion Unprecedented in Complexity,” Engineering News-Record 2 November 1998, 19. 4 Nadine M. Post, “Record-Breaking Implosion Unprecedented in Complexity,” Engineering News-Record, 2 November 1998, 19. 5 Judy DeHaven, “Today, We Say Goodbye to Years of Frustration,” The Detroit News and Free Press, 25 October 1998. 6 Lisa Jackson and Mark Puls, “Partygoers Revel as Building Drops,” The Detroit News and Free Press, 25 October 1998. 7 “People Mover Will Remain Closed Longer Than Expected,” Associated Press, 27 October 1998. 8 Ron French, “Razing Paves Way for Renewal,” The Detroit News and Free Press, 25 October 1998. 9 Wayne Woolley, “Nostalgia Lures Crowd to Experience Drama,” The Detroit News and Free Press, 25 October 1998. 10 Santiago Esparza, “Dust Clouds Swallow Downtown,” The Detroit News and Free Press, 25 October 1998. 11 Blair J. McGowan, letter to the editor, The Detroit News, 6 November 1998. 12 Janet Naylor, “Few Invited to See Hudson’s Blow Out,” The Detroit News, 15 October 1998. 13 Kevin Lynch, “Hudson’s Implosion Dust Safe, Tests Find,” The Detroit News, 30 October 1998. 14 Jennifer Dixon, “State to Probe Implosion for Safety of Workers,” The Detroit News and Free Press, 31 October 1998. 15 Jennifer Dixon, “State to Probe Implosion for Safety of Workers,” The Detroit News and Free Press, 31 October 1998. 16 Martha A. Churchill, “TV Slant on Implosion Plays to Hysteria,” The Detroit News, 3 November 1998. 17 Janet Naylor, “Hudson’s Rubble Turns to Charities’ Treasure,” The Detroit News, 4 November 1998. 18 Gregory D. Watson, letter to the editor, The Detroit News, 29 October 1998. 19 Iver Peterson, “Downtown Detroit Shops for a Future, but Not at Once-Grand Hudson’s,” New York Times, 23 December 1979. 20 Dan Hoffman, “Erasing Detroit,” in Architecture Studio: Cranbrook Academy of Art, 1986-1993, 28. 21 See Allen C. Goodman, “Detroit Housing Rebound Needs Safe Streets, Good Schools,” The Detroit News, 10 March 2004. 22Stalking Detroit, eds. Georgia Daskalakis, Charles Waldheim, and Jason Young, 14. 23 Jeff Long, Patrick T. Reardon, and Blair Kamin, “A Squandered Heritage: The Alternatives,” Chicago Tribune, 15 January 2003. 24 Cameron McWhirter and Darren A. Nichols, “City Council’s Blunders Speed Detroit’s Decline,” The Detroit News, 28 October 2001. 25 Cameron McWhirter, “Wrecking Homes Standard Practice,” The Detroit News, 19 June 2001. 26 Jodi Wilgoren, “Shrinking, Detroit Faces Fiscal Nightmare,” New York Times, 2 February 2005. 27 Cameron McWhirter, “3-Day Arson Spree Hurt City’s Image,” The Detroit News, 20 June 2001. 28 “Detroit Mayor Dennis W. Archer Thanks Thousands for Their Help In Shaping a Successful Angels’ Night Career,” City of Detroit press release, 2 November 2001. 29 Charles Waldheim and Marili Santos-Munné, “Decamping Detroit,” in Stalking Detroit, eds. Georgia Daskalakis, Charles Waldheim, and Jason Young, 107. 30 Dennis Byrne, “Downsizing Cities Has an Up Side,” Chicago Sun-Times, 4 May 1993. 31 David Usborne, “Motor City Fights Against Fulfilling a Death Wish,” The Independent (London), 31 May 1993. 32 Nancy Costello, “Detroit Official Proposes Turning Blighted Neighborhoods Into Pastures,” Associated Press, 5 May 1993. 33 “Day of the Bulldozer,” The Economist, 8 May 1993, 33. 34 “Clearance Sale for Detroit?”, Detroit News, 30 April 1993. 35 Nancy Costello, “Detroit Official Proposes Turning Blighted Neighborhoods Into Pastures,” Associated Press, 5 May 1993. 36 Kim Trent, “Official’s Plan Would Put Detroit’s Slums Out to Pasture,” The Detroit News, 27 April 1993. 37 David Usborne, “Motor City Fights Against Fulfilling a Death Wish,” The Independent (London), 31 May 1993. 38 Scott Bowles, “Some Rooted in Decaying Blocks Vow They’ll Stay,” The Detroit News, 30 April 1993. 39 Michael Betzold, “Vacant Lots Cast Blight on Neighborhoods,” Detroit Free Press, 13 August 1990. 40 Detroit City Planning Commission, “Survey and Recommendations Regarding Vacant Land in the City,” 24 August 1990. 41 Charles Waldheim and Marili Santos-Munné, “Decamping Detroit,” in Stalking Detroit, eds. Georgia Daskalakis, Charles Waldheim, and Jason Young, 105. 42 Joseph P. Fried, “City’s Housing Administrator Proposes ‘Planned Shrinkage’ of Some Slums,” New York Times, 3 February 1976. 43 Roger Starr, “Making New York Smaller,” The New York Times Magazine, 14 November 1976, p. 105. 45 Witold Rybczynski, “The Zero-Density Neighborhood,” Detroit Free Press Sunday Magazine, 29 October 1995, 17. 46 Kate Stohr, “Shrinking City Syndrome,” New York Times, 5 February 2004. 47 Patricia Montemurri, Zachare Ball, and Roger Chesley, “15,215 Buildings Stand Empty,” Detroit Free Press, 9 July 1989. 48 “Introduction: Committee Work,” Stalking Detroit, eds. Georgia Daskalakis, Charles Waldheim, and Jason Young, 13. 49 Peter Gavrilovich, “Rubble Sits...And Sits...And Sits...,” Detroit Free Press, 13 July 1989. 50 Zachare Ball and Dori J. Maynard, “Neighborhood ‘House-Busters’ Strike Again,” Detroit Free Press, 2 July 1989. 51 Mike Williams, “Neighbors Keep Up Demolition,” Detroit Free Press, 3 July 1989. 52 Anne Kim, “Fists Fly as House Debris Blocks Chatham,” Detroit Free Press, 7 July 1989. 53 Michael Betzold, “Don’t Do It Yourself, Demolition Expert Says,” Detroit Free Press, 4 July 1989. 54 Constance Prater, “Have Patience With Vacant Houses, Council Pleads,” Detroit Free Press, 6 July 1989. 55 “Soundoff: Should Residents Tear Down Abandoned Dwellings?,” Detroit Free Press, 4 July 1989. 56 Anne Kim, “City Gets Tough on House-Busting Neighbors,” Detroit Free Press, 8 July 1989. 57 Anne Kim, “House-Busters Say They Feel No Regrets, May Wreck Again,” Detroit Free Press, 9 July 1989. 58 Darci McConnell, “Council Suspects Politics is Driving Demolition Plan,” Detroit Free Press, 21 October 1997; Robert Ankeny, “Archer Seeks $50M to Raze Buildings,” Crain’s Detroit Business, 1 September 1997. 59 Alyssa Katz, “Dismantling the Motor City,” Metropolis, June 1998, 33. 60 Jennifer Dixon and Darci McConnell, “HUD Hands Detroit a $160-Million Gift Days Before Election,” Detroit Free Press, 29 October 1997. 61 Alyssa Katz, “Dismantling the Motor City,” Metropolis, June 1998, 37. 62 “Demolishing the City,” editorial, The Detroit News, 11 November 1998. 63 “Abandoned Housing Misery,” editorial in The Detroit News, 24 September 2000. 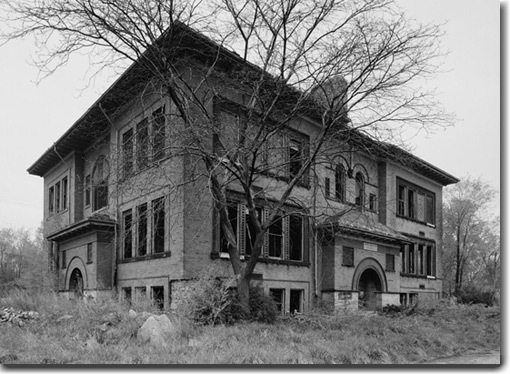 64 Cameron McWhirter and Brian Harmon, “Derelict Buildings Haunt School, Kids,” The Detroit News, 24 September 2000. 65 Cameron McWhirter, “Detroit Seeks to Increase Condemnations,” The Detroit News, 2 November 2000. 66 Cameron McWhirter and Darren A. Nichols, “City Council’s Blunders Speed Detroit’s Decline,” The Detroit News, 28 October 2001. 67 Sarah Karush, “Detroit Gets New Weapon Against Urban Decay: Blight Court,” Associated Press, 30 December 2004. 68 Cameron McWhirter, “Detroit Destroys Vacant Buildings,” The Detroit News, 1 November 2000. 69 Cameron McWhirter, “Bureaucracy Chokes Detroit,” The Detroit News, 29 October 2001. 70 Jodi S. Cohen, “Schools Ignore Vacant Houses,” The Detroit News, 25 November 2001. 71 Cameron McWhirter and Darci McConnell, “Kilpatrick Gets Ready to Start Demolitions,” The Detroit News, 29 January 2002. 72 Darren A. Nichols, “$10 Million Gift to Raze Detroit Eyesores,” The Detroit News, 7 May 2003. 73 M.L. Elrick, “Big Donor’s $10 Million Will Raze City’s Eyesores,” Detroit Free Press, 7 May 2003. 74 R.J. King, “Detroit’s Eyesores Slated for Cleanup,” The Detroit News, 9 August 2002. 75 Camilo José Vergara, American Ruins, 23. 76 Camilo José Vergara, “Downtown Detroit,” Metropolis, April 1995, 33. 77 Camilo José Vergara, “Downtown Detroit,” Metropolis, April 1995, 35. 78 Camilo José Vergara, “Downtown Detroit,” Metropolis, April 1995, 36. 79 Camilo José Vergara, “Downtown Detroit,” Metropolis, April 1995, 36. 80 Camilo José Vergara, “Downtown Detroit,” Metropolis, April 1995, 37. 81 Dan Hoffman, “The Best the World Has to Offer,” in Stalking Detroit, eds. Georgia Daskalakis, Charles Waldheim, and Jason Young, 43. Reprinted from Rubble, by Jeff Byles © Jeff Byles. Published by arrangement with Random House. 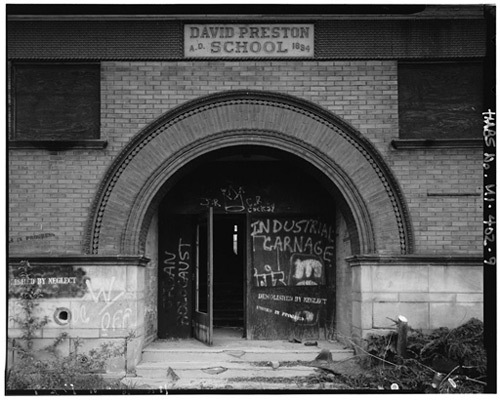 Photographs: Preston School, 1251 Seventeenth Street, between Fort & Porter Streets, Detroit, Wayne County, MI. Courtesy Library of Congress, Prints and Photographs Division, Historic American Buildings Survey, Reproduction Numbers HABS MICH,82-DETRO,62-8 and HABS MICH,82-DETRO,62-9. This article originally appeared in Issue 2, January 2006. Jeff Byles has written about architecture, urbanism, and culture for The New York Times, Village Voice, Cabinet, The Believer, and other publications. He lives in New York City. For more about his work, see www.jeffbyles.com. Buy Jeff Byles's books through Amazon at the LOST Store.